Merry Christmas to you Wendy. And that cute, cute dog of yours. 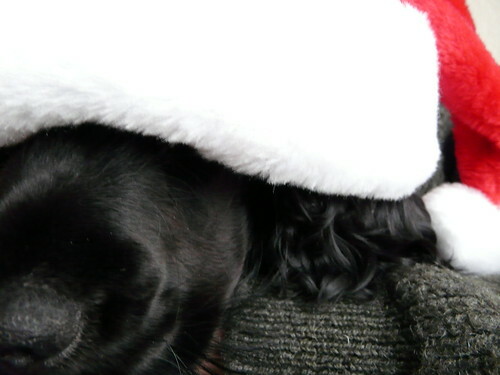 Love him buried in that Santa hat! Merry Christmas Wendy and Marco – hope it is a veritable feast and you keep warm! Merry Christmas Wendy & Marco! Merry Christmas! I hope it is your best yet. Merry Christmas and a very Happy New year to you, Marco and your lovely feller! Hope you had a great Xmas and here’s to a Happy New Year and a better 2009. Your lanttulaatikko turned up on our Christmas dinner table, btw. Tasted great, but we weren’t expecting the quiche-like texture which the egg brought to the dish. All the best.